/wp-content/uploads/2019/02/GettyImages-467729448.jpg 483 724 Cranston Material Handeling Equipment http://cranston-material-handling-equipment.com/wp-content/uploads/2017/03/cr-logo.png Cranston Material Handeling Equipment2019-03-05 10:00:152019-02-25 21:56:07How Much Does New Pallet Racking Cost? 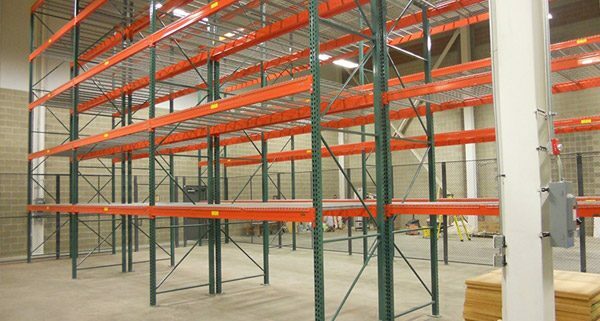 Pallet racking is an integral part of warehouse operations and material storage throughout a plant. Damage can occur to your racking at any time and when it happens, it compromises the safety of your employees. No matter the type of business or product you store, it is important to have an inspection and maintenance plan in place for your pallet racking. Ultimate Granite has been transforming the interiors of Pittsburgh-area homes and offices since 2002. Lead by the son and father team of Chris and Dwight Morrow, with over 35 years of combined industry experience between them, Ultimate Granite is Western Pennsylvania’s premier supplier of counters and tabletops. They pride themselves on their ability to offer a wider selection of countertop materials, more personalized service, and more competitive pricing than the rest of the local market. With business continuing to grow and prosper, Ultimate Granite had the opportunity to upgrade their operations and needed help. They turned to Cranston Material Handling Equipment Corp. (Cranston) of Pittsburgh to develop a solution. For years, Ultimate Granite had just one machine to cut their stone tops. The process required lifting and loading slabs of stone that could weigh well over 1,000 pounds. 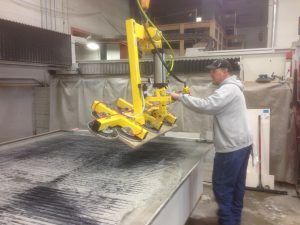 Their business, however, had grown to the point that they needed a way to safely speed up the process of moving the stone slabs in order to support the additional production of counter tops their new water jet and saw blade combo machine was capable of producing. 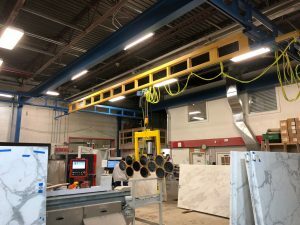 In practical terms, the solution would require a crane system to fit in a very congested work area with limited headroom, while providing unobstructed access from the staging area to the existing and new saw. Cranston was able to provide a crane that enables the employees to pick up a stone from the staging area and then almost effortlessly move the slab to one of the saws. The 50’ span of the header beams allow the crane’s columns to be nestled along the wall creating unobstructed access throughout the work area. The precise positioning of the runway on the header beams allows for loading both the old and new cutting machines, which are on either side of the 50-foot-wide room. Incorporating the Wood’s Powr-Grip Vacuum Tilter into the system allows Ultimate Granite’s employee’s to easily and safely lift and position the slabs of stone onto and off of both saws. Ultimate Granite is very pleased with the enhanced workflow created by combining a vacuum lift with the workstation crane system. The new system has dramatically improved the speed and ease of loading while increasing safety throughout the cutting and finishing process. Cranston Material Handling Equipment Corp. looks at your material handling or storage application through the lens of decades of experience. Whatever you’re specific needs we can help you sort through options to maximize your workspace. Contact us for more information today at cmhec.com or 412-741-8060.